This is a brief overview of what needs to be done in Vinsight to get WET Tax calculating correctly, for more detailed step by step instructions, see WET Tax Set Up & Use – Detailed Instructions. Turn on WET Plugin in the Settings > Addons area. Ensure your Contacts are set up with the correct WET tax attributes. If they are an Australian wholesale customer, you will need to supply their ABN. Make sure you have set the country of all Australian customers to “Australia”, otherwise any orders to them will be treated as exports and not liable for WET Tax. 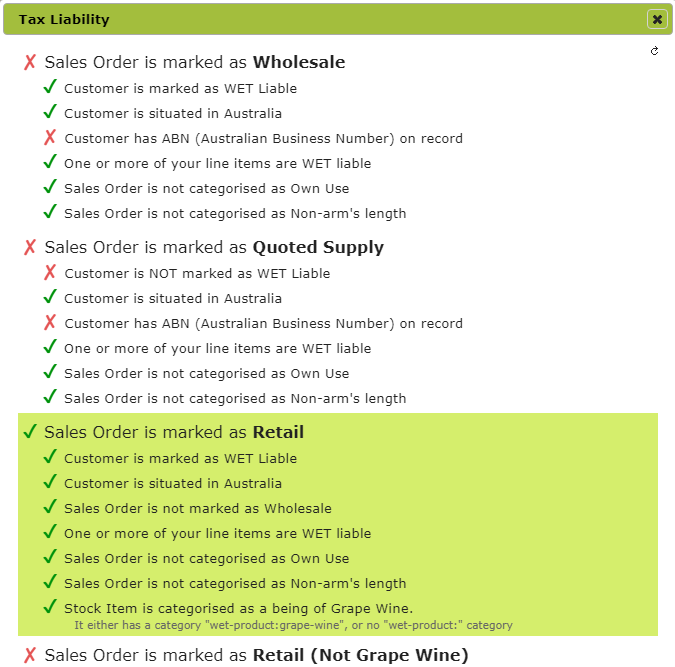 Make sure your finished wine stock items and marked with “WET Tax Liable” and also have the “WET Tax Rate” supplied. You should also turn on the attributes “Can Sell” and “GST Liable”. 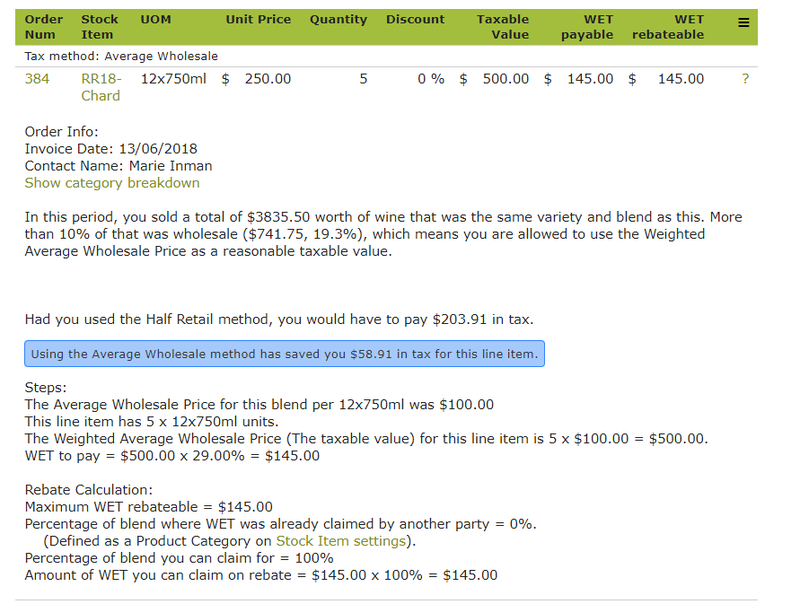 Now you can raise Sales Orders to those customers with your finished wine, and the WET tax will be calculated for each order. At the end of the tax period, you create a “WET Assessment” for the period. It will look up every sales order within the defined period that needs WET tax calculated and accumulate everything for you in one place. The assessment will also choose different calculation methods for different wines, in order to minimize the total amount of tax you have to pay. Go to Settings > Addons, find the WET add-on and click ‘Setup’. Note: You should select ‘Eligible’ simply if you are are a wine or cider producer. You do not need to worry here about specific product or transaction eligibility requirements, such as the 85% ownership rule. These are dealt with at another place in the App. You might see a warning directly beneath the ‘Division’ drop-down box stating the ‘Addon is NOT configured correctly Division is not set’. 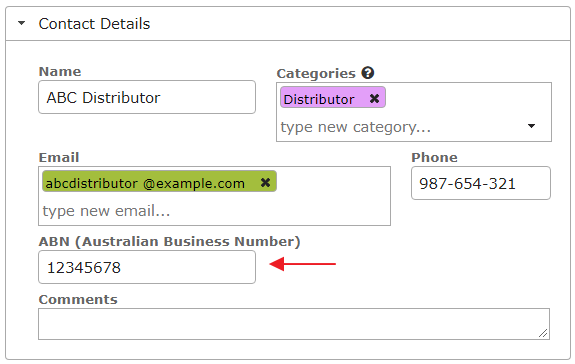 If your customer is a wholesale customer, ensure that you include their ABN (Australian Business Number) in the Contact Details area. Tip: If you don’t have the number to hand, it is okay to just put a place-holder such as ‘TBA’ in there until you obtain the correct information. However, it is important to put something in this field, as it signals to Vinsight that the customer is a wholesale one. Please also note that, if you ever get audited, the ATO will require that you have the actual ABN. Go to the ‘Contact Addresses’ area in the Contact and ensure that the Customer’s country is set to “Australia”. Otherwise any orders to them will be treated as exports and not be liable for WET Tax. In the ‘Contact Attributes’ area ensure that you have the ‘Customer’ attribute turned on so you can sell to them. You will also need to switch WET Liable to ‘Yes’ . . .
unless you are selling to the customer under quote, in which case you can leave the WET Liable attribute as ‘Quoted’. (Note the ‘Quoted’ option will only be available if you have entered an ABN number in the Contact Details area as described above. Set the WET Own use attribute if this is relevant to this customer, e.g. tastings, promotional give-aways, donations. Similarly set the ‘Related Party’ attribute if the customer is a staff member or relative (or someone else who may not be charged a reasonable commercial value for the product). 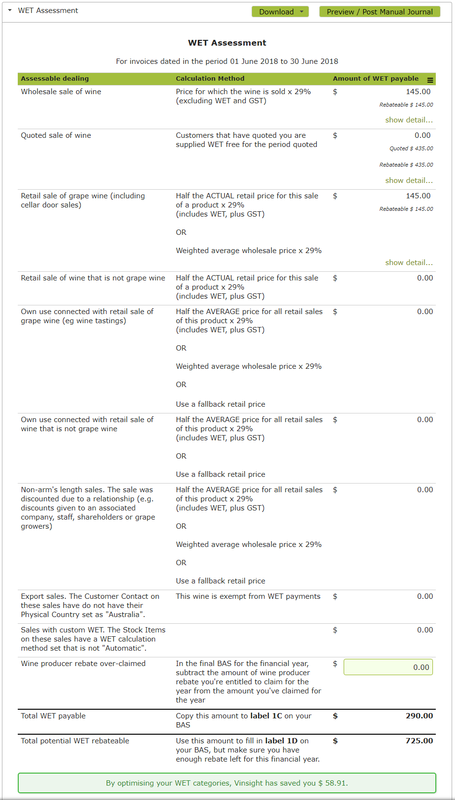 Note: The ATO requires WET be paid on wine for own use and that this WET be calculated on a ‘notional wholesale price’. (See Wine for own use and Retail sales and own use). The WET Own use and Related Party flags allow Vinsight to determine a notional wholesale price when calculating WET for these transactions. Remember to click ‘Save’ to save any changes you have made. Stock Items are found by navigating to Count > Stock Items. For more information about setting up and editing Stock Items generally see our Stock Items Documentation. 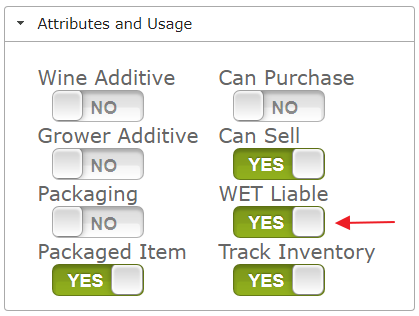 All wine and cider finished products that you purchase or sell through your business should be marked as WET Liable in the ‘Attributes and Usage’ area of the Stock Item. 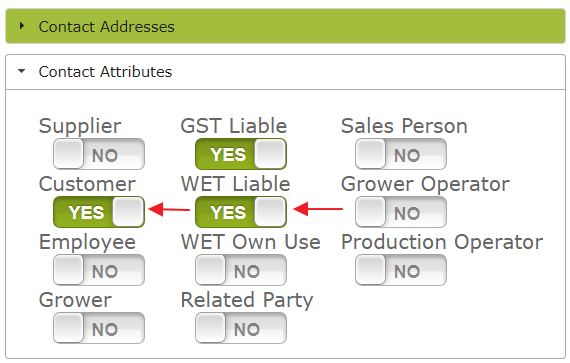 Setting the ‘WET Liable’ attribute to “yes”, will create are new ‘WET Liability’ area in the Stock Item, just below ‘Sales, Purchases and Taxes’. 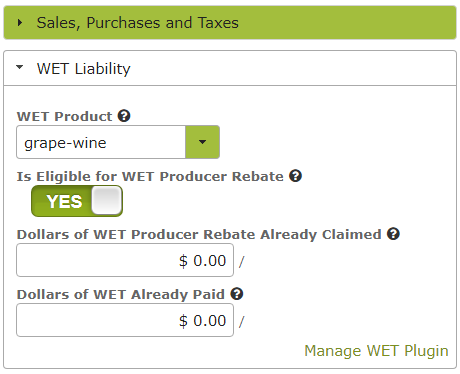 Is Eligible for WET Producer Rebate: This is where you identify whether the product in question is eligible for the WET producer rebate or not (e.g. does it meet the ‘ownership of 85% source product’ rule, packaging requirements etc.). See Eligibility for the producer rebate – ATO for criteria. Dollars of WET Producer Rebate Already Claimed: This is where you input any WET Producer Rebate already claimed on the product. This may come up if, e.g. a supplier has previously claimed a WET rebate on wine you purchased to blend with the product made primarily from source product you own, or, if you yourself have previously claimed a rebate with respect to some or all of the blend. You can use mathematical formula to perform calculations in these fields. Clicking the help ‘?’ icons will give you a more detailed example, but the image below shows what you would see if you entered 15,000 x 29% / 10,000 x 750/1000 x 12 into this text field. Note the running total below the text field that updates as you add each new calculation. Pressing ‘Enter’ will put the running total into the text-field. . . Dollars of WET Already Paid: If you have already paid WET on this product, e.g. when importing it, you should enter the amount paid here. 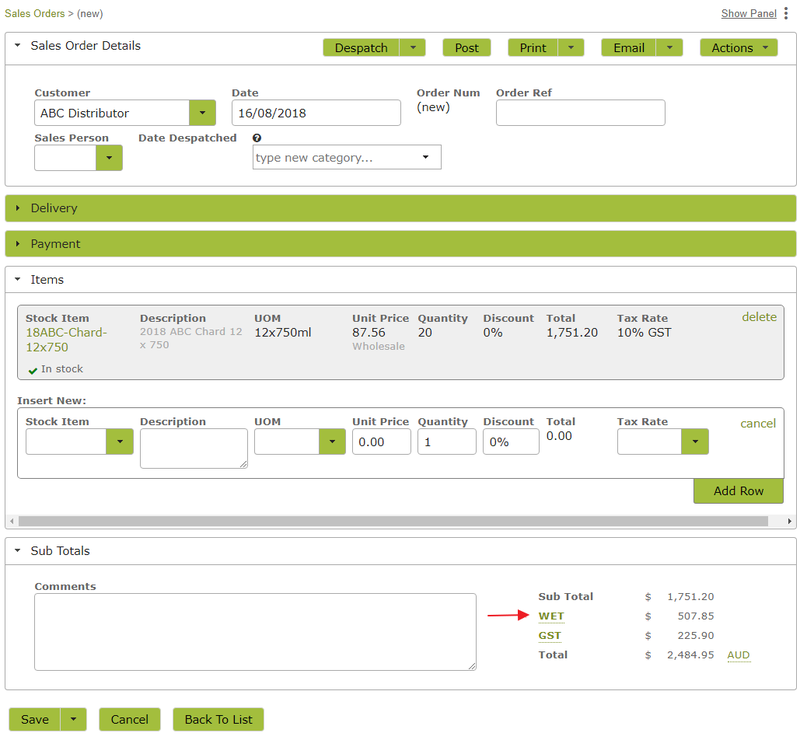 If you have everything set up correctly, any Sales Order you generate should automatically determine the WET Tax category, which is displayed in the Sub Totals area at the bottom. The WET amount has been calculated automatically. 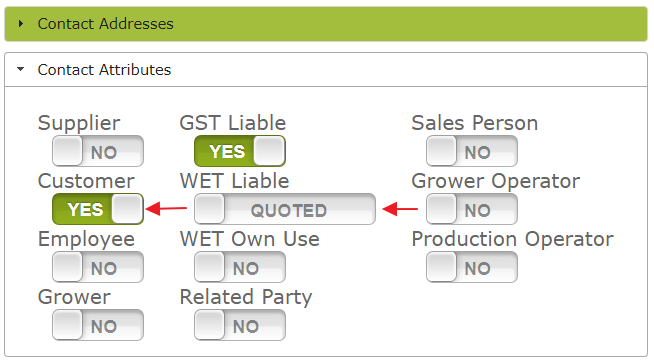 Clicking the ‘WET’ link will take you through to a breakdown of the tax on the sales order, detailing that it has been assessed as a ‘wholesale’ transaction. Clicking the ‘Assessed in BAS as wholesale’ link will give you further information. . . The highlighted portion will show the category Vinsight has placed the order in. If this category is wrong, look through the highlighted list of features to see what could have caused the mistake. You can also look through the features of the category you believe the sales order in question truly belongs in. Features marked with a red ‘X‘ are features not present in the current sales order that indicate why it is not in that other category. For example if you thought the above Sales Order should be marked as Export, looking at the Export category, you will see that this Sales Order has not met the criteria ‘Customer is not situated in Australia’. This would indicate that you should look at the Contact in question and check it’s address, Country setting. Similarly failing to set a wholesale customer’s ABN number will result in the Sales Order being marked as retail. 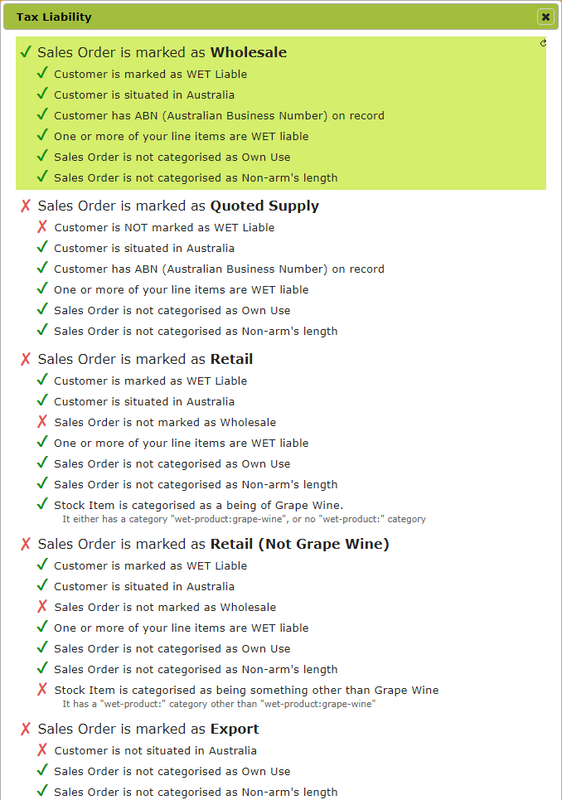 In the following image, looking to the Wholesale category, you will see that the feature ‘Customer has ABN (Australian Business Number) on record’ has a red cross ‘X‘ next to it, indicating this has not been set. Direct sales from wine producers to retail customers will not show a WET component on the invoice. When creating a WET assessment, Vinsight will determine whether the ‘half retail’ or ‘average wholesale cost’ methods of calculating WET on direct retail sales will result in the lowest tax liability and choose which method to use accordingly. This means the actual WET component of a retail invoice will be unknown at the time it is created. To create a WET Assessment, go to Account > WET Assessments and click ‘New’. Selecting ‘Invoice Date’ for the ‘Date property for range’, will cause the assessment to run using Sales Orders with the Invoice Date within the defined Period. Selecting ‘Date Paid’ will cause the assessment to run using Sales Orders that were fully paid on a date within the defined period. 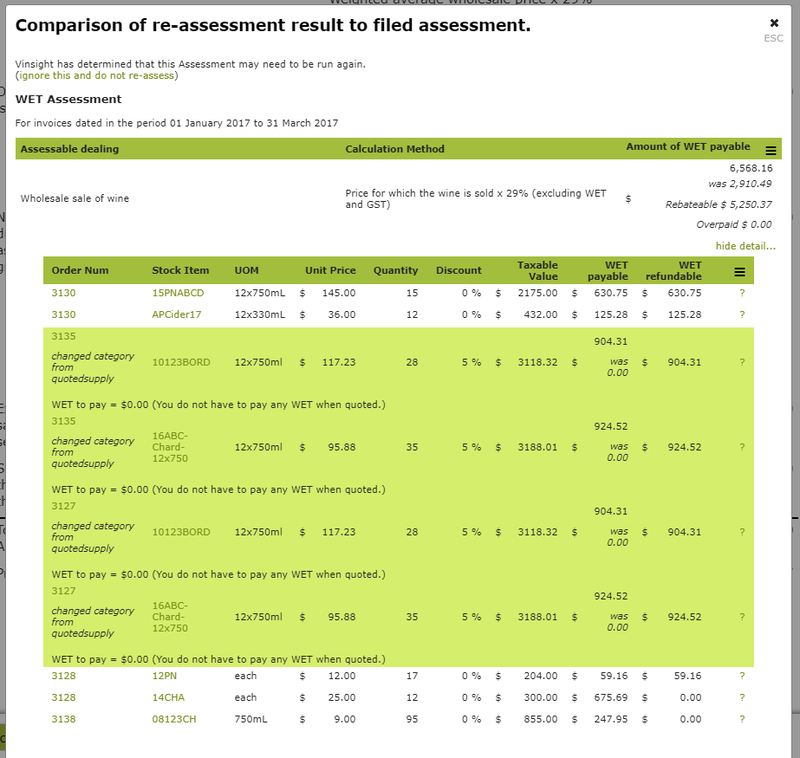 Switching ‘Check previous Assessments’ to ‘Yes’ will cause Vinsight to check previous Assessments within the financial year of this assessment to see whether the tax status of any orders in that prior assessment have changed since it was run. Keeping it as ‘No’ will mean previous assessments will not be checked at all. 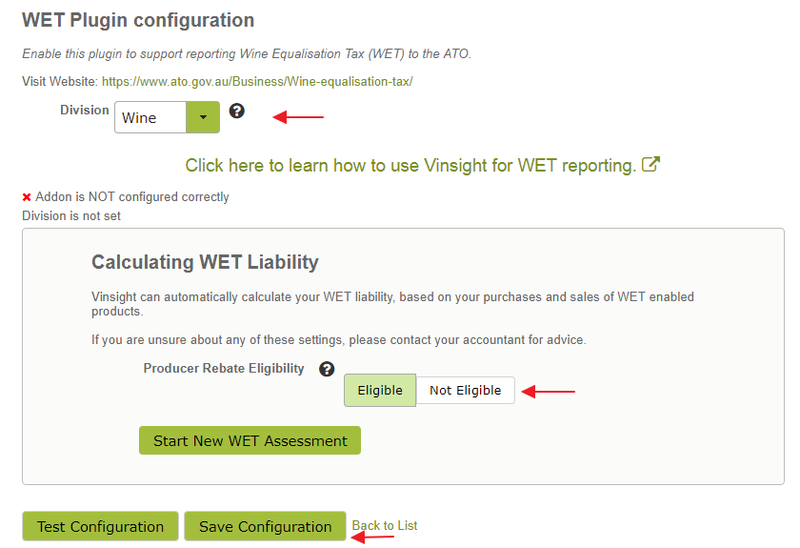 Once you have filed your BAS with the ATO, then you should come back to Vinsight and press at the bottom of the WET Assessment to lock in the data for later viewing. Please note Vinsight will not actually file anything with the ATO. You will need to complete and file your Business Activity Statement (BAS) with the ATO yourself. However clicking ‘File Now’ lets Vinsight know that this was the version filed. This step is crucial, as it means that, if you need to change something on a Sales Order in the past, Vinsight will be able to look up the filed assessments and give you an adjusted value to pay, based on the WET you have already paid for that Sales Order. It will also give you a very detailed audit trail when you need to prove you have paid the correct amount of tax in a dispute. You might come across a need to alter a Sales Order from the past that has already had it’s WET paid to the ATO. In this case, simply change the Sales Order to be correct. Any adjustments will be picked up next time you file a WET Assessment, and will appear there in an easy to understand format about what has changed and why. Provided you have switched “Check previous Assessments’ to yes, any changes will be shown under the heading “Previous Assessment Adjustments” on a new WET Assessment. In the following example, we determined that we had incorrectly recorded a customer we sold to in the previous quarter, as having purchased using ‘Quoted Supply’, when they should actually have been recorded as ‘WET liable’. We corrected the customer’s attributes in Contacts before running the Assessment for the current WET period. This change is picked up in the Previous Assessment Adjustments section toward the bottom of the WET Assessment. If you do not wish to include this adjustment in the current assessment (for example, if the customer was purchasing using quoted supply during the last time period and has only recently changed to WET Liable), you have the option of clicking “ignore adjustment, at this stage. To include the adjustment, simply click File Now.